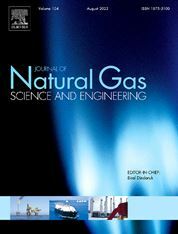 The objective of the Journal of Natural Gas Science & Engineering is to bridge the gap between the engineering and the science of natural gas by publishing explicitly written articles intelligible to scientists and engineers working in any field of natural gas science and engineering from the reservoir to the market. An attempt is made in all issues to balance the subject matter and to appeal to a broad readership. The Journal of Natural Gas Science & Engineering covers the fields of natural gas exploration, production, processing and transmission in its broadest possible sense. Topics include: origin and accumulation of natural gas; natural gas geochemistry; gas-reservoir engineering; well logging, testing and evaluation; mathematical modelling; enhanced gas recovery; thermodynamics and phase behaviour, gas-reservoir modelling and simulation; natural gas production engineering; primary and enhanced production from unconventional gas resources, subsurface issues related to coalbed methane, tight gas, shale gas, and hydrate production, formation evaluation; exploration methods, multiphase flow and flow assurance issues, novel processing (e.g., subsea) techniques, raw gas transmission methods, gas processing/LNG technologies, sales gas transmission and storage. The Journal of Natural Gas Science & Engineering will also focus on economical, environmental, management and safety issues related to natural gas production, processing and transportation. Research articles, case histories, field process reports, short communications, book reviews, symposia proceedings and review articles are accepted. Generally, review articles on some topic of special current interest will be published. To view a more detailed outline of the topics the journal publishes please click here. Shell Exploration and Production Inc.